Yes, I’m a foodie. I love to cook and to eat. I am not vegan or vegetarian. I am a protein hound, but most of all I love spices, all kinds of spices. My main message is to play with your food. Play with the flavors and spices. Adapt to what you have on hand. I keep a good variety of spices and try to use them in unconventional combinations. 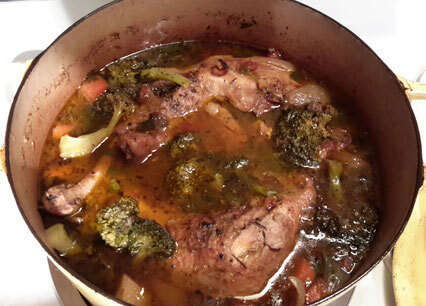 Snowy Day Chicken Stew – this recipe was invented today. You may adjust the spices to your level and the ingredients to number of people you want to feed. This roughly serves two. Free Range organic local chicken – I had 2 legs and thighs in my freezer, but you could use breasts just as well. Black sesame seed, roughly a tablespoon. Today I added ½ teaspoon of honey at the end. The sauce was a little bitter from the extra skin and white part of the blood oranges I added for the slight tartness and the bioflavonoids they contain. It truly richened the entire dish. Brown the chicken after it is thawed in organic raw coconut oil with a third of the garlic. Add everything else and cook until the chicken is falling apart. Today I added some broccoli in when it had about 20 minutes to go as that was the green in my fridge. It might have been Kale or Chard on another day. I will serve this over pasta which today happens to be organic adzuki bean pasta. If you like rice, brown organic rice would be terrific, or even quinoa and corn organic pasta of any shape. You can always adjust spices up or down. If you over spice, just add some celery to absorb the excess but you probably will not want to eat the celery.